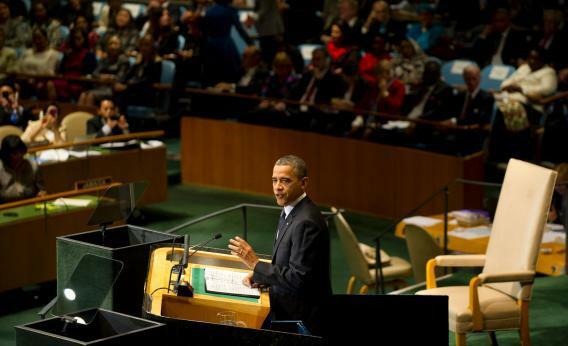 I’d expect Obama’s speech to the U.N. General Assembly to be pulled apart the same way. It was well crafted, with an opening and a close about America’s murdered ambassador to Libya, Chris Stevens. But for the umpteenth time, Obama asked the world to view its challenges the way he’s asked Americans to view theirs. “Burning an American flag does nothing to provide a child an education,” he said. “Smashing apart a restaurant does not fill an empty stomach. Attacking an embassy won’t create a single job.” How banal can you get? And how repetitive? In 2011, Obama used some of his time to address the civil war in Syria. As we meet here today, men and women and children are being tortured, detained and murdered by the Syrian regime. Thousands have been killed, many during the holy time of Ramadan. Thousands more have poured across Syria’s borders. The Syrian people have shown dignity and courage in their pursuit of justice – protesting peacefully, standing silently in the streets, dying for the same values that this institution is supposed to stand for. And the question for us is clear: Will we stand with the Syrian people, or with their oppressors? In other words, stasis. How much do Republicans want to keep worrying the foreign policy issue? I know of at least one GOP group that’s going to buy a few million dollars of ads on foreign policy, midway through October, to smack Obama. The theory is that the media’s built him a glass jaw, and no one’s ever taken a hard swing at it.